Easter crept up on me this year. On Saturday, my husband and I attended a funeral,which turned into a beautiful celebration of life. My best friend's dad lost his battle to cancer, and while sad, it was incredibly touching to see the legacy he left behind for his wife of nearly sixty years, their four children and his ten grandchildren. For Easter, my parents joined my husband and me and my mother-in-law for brunch. 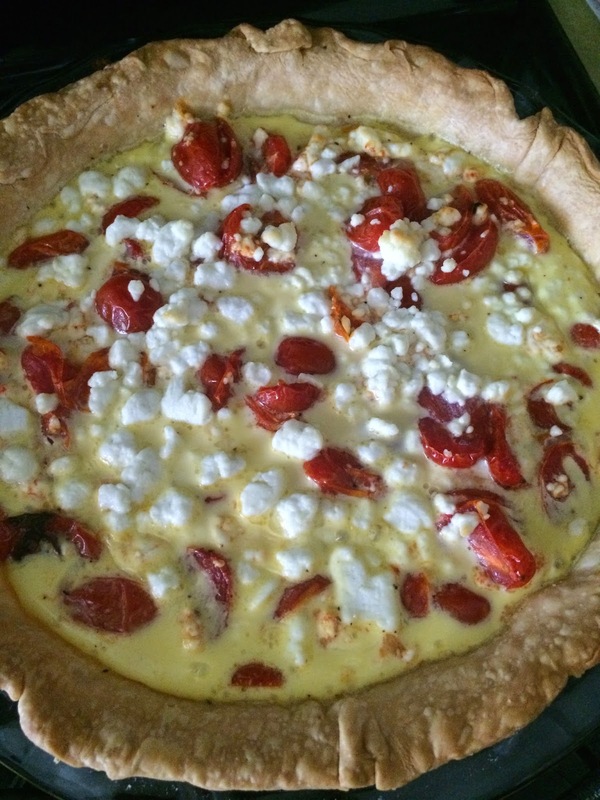 Like last year, I made a roasted tomato and goat cheese quiche. 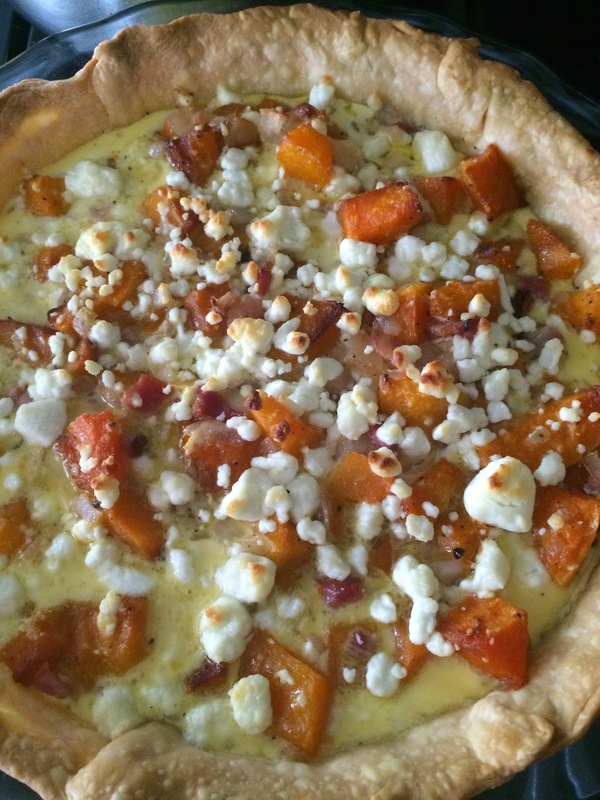 But this year, I added a quiche made with roasted butternut squash, caramelized shallots and pancetta, and goat cheese. Quiche with roasted squash, caramelized shallots and pancetta, and goat cheese. 8 ounces of crumbled goat cheese, split into 2-4oz. portions. Peel and cut your squash into bite size pieces. I used the pre-cut squash from the supermarket. Toss with olive oil, salt and pepper. Use just enough olive oil to keep the squash from sticking. Spread into a single layer onto a cookie sheet and bake at 400 for about 30 minutes. Then set aside in a medium sized bowl. Spread the pie dough into your pie plate. Set aside. 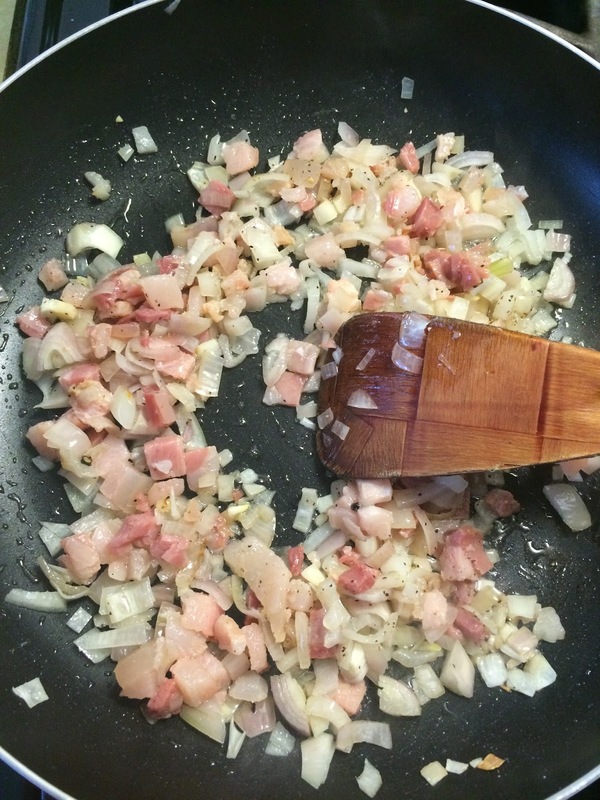 In a small sauté pan, add the pancetta and minced onion in about 1-2 teaspoons of olive oil. Cook until brown and caramelized, about 10 minutes, more or less. Add the pancetta and shallots to the squash. Mix well. Starting to cook it down. Add about 4 ounces of goat cheese to the squash mixture. Put mixture into empty pie shell. Beat the eggs and yolks well. Add the half and half and continue to beat until frothy. Pour the egg mixture over the squash mixture in the cooked pie shell. Bake at 375 for about 30 minutes, or until the custard is set. Do not eat right away. Allow the custard to set up. Eat at room temperature or slightly above. The asparagus, tossed with olive oil, salt and pepper, was roasted at 400 degrees for about 15 minutes. When it came out of the oven, I squeezed on a half lemon's worth of juice. Everything was delicious, including the other quiche with roasted tomatoes. And the jelly beans...just because. I like the pink and white ones...eaten together though. What's your favorite? Did you host or attend an Easter feast? What was on your menu? This has most of my favorite things in it...yum! well - just YUM! Especially the roasted tomato version. I am a huge fan of the roasted grape tomato! This is absolutely delicious! I am going to have to make this soon! Thanks for sharing! Wow, major yum! I love making quiche and now I can't wait to make this one. Thanks so much! Looks incredibly yummy! I want to make it! Did someone say goat cheese? My favorite! It's so easy and delicious. Enjoy, Rebecca! It was delicious. We were happy and full. Easy, delicious and filling. A perfect meal. I love the tomato one too, Laura. It is delicious! Enjoy! I love when funerals turn into reunions and also, that quiche looks amazing! That looks delish. I love Butternut Squash. Hi Kelly, what a nice combination, and I like the pancetta- butternut squash combination, and the roasted tomato and goat cheese, a classic I could never pass up to be sure. Funerals, though sad, very often bring people together in a meaningful way, such as the tribute you experienced on Saturday. Sorry for the loss, and joyous for the life he lived and shared so greatly with others. It was delicious. Ours was low key, for sure, but nice. And despite today's snow, spring is finally on its way. Have a great rest of your week, Christy. I do too. I put the leftovers on salad. Delicious!